The introduction of the iPhone by Apple a few years back caused a lot of excitement among both consumers and developers. The iPhone was arguably the first mobile device that made both mobile computing and web surfing practical. The iPad (which runs on iPhone OS) has been met with skepticism in some quarters. But so far it appears to be selling well and attracting a lot of interest from content creators. Apple originally intended that the main source of third-party applications for the iPhone would be web applications, and there are of course many of these. But something funny happened when Apple released the iPhone SDK and an App Store to go with it – people came. Developers developed and consumers consumed. In this article I’ll be looking introducing iPhone-OS content development and give a high-level view of what is involved. Hopefully this will be enough to allow you to figure out if and where you need to go next. While it is tempting to differentiate between application and web-application development, it is important to remember that the iPhone can be used to browse many (if not most) web sites. The iPhone touch-screen interface, with its support for gestures (e.g. pinch the screen to zoom), makes surfing on the iPhone a relatively decent experience. So you can just develop your web site as you might normally do and chances are, iPhone users will be able to use it. But of course the iPhone screen is considerably smaller than laptop or desktop screens. If you want to serve up web content to iPhone users, it makes a sense for a site to cater specifically to the device’s small screen size. In addition though, the iPhone’s browser – Mobile Safari – has some great features that can be leveraged to make a really compelling web experience. 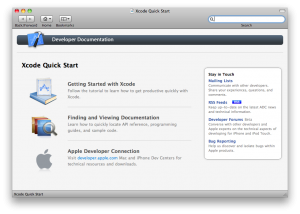 And Apple have made it easy by providing web developers with a tool – Dashcode – that can used to produce those web apps. When Apple released the iPhone and developers got a chance to play with the applications shipped by Apple, a great cry was heard throughout the land. Alas, the cry largely came from developers who wanted a chance to write their own applications for the device. The tool suite provided by Apple made it relatively easy for developers to create compelling applications for the platform. The App Store made it (relatively) easy for developers to distribute their applications to the public. While stories are sometimes heard about the difficulties associated with getting apps onto the store, there is still no comparable platform among competing devices. It’s getting there, but to the best of my knowledge it ain’t there yet. This is probably a hard question to answer in some ways. If you already have existing web content, it may makes sense to re-package some (or all) of it for iPhone users. The same logic you would use to decide between a desktop verses a web application applies here: for instance if your application delivers data that changes very often, then a web application may make sense. One criteria that has often been key in making this choice, was the need for the application to work when the device is not connected to the network. This is less relevant though as the iPhone supports HTML5 offline mode. This means you can actually create web applications that store data on the device so that users can continue to use the application even when they are not connected. I’ll have more to say on this later when discussing full-blown application development later in this article. Tools – who need tools? Well you could always use Dreamweaver to create your iPhone web assets (or whichever HTML authoring tool you like). 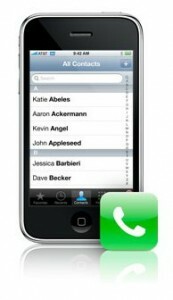 But Apple provides Dashcode which is designed to make creating iPhone web apps really easy. If you’ve ever done any Mac development, then Dashcode will look quite familiar as it is part of the XCode suite of development tools. You can download the suite from Apple’s development website at http://developer.apple.com. 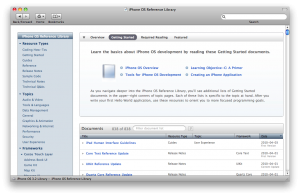 Look for the links to the IPhone Dev Center and then the iPhone SDK 3.x (currently 3.2). You’ll need to sign up for a developer account – but it’s free. You’ll need a Mac to run the tools – they will not run on Windows or Linux. Some people find the latter requirement a little unfair, but there is one good technical reason for it (aside from any commercial considerations Apple may have). The iPhone OS is actually a slimmed-down version of Mac OS and the simulator tools provided by Apple leverage your Mac’s own operating system. I won’t be going into great detail here about how to use Dashcode, but I do want to point out some key details. The first is that – as you would expect – Dashcode provides some templates out of the box to get you started. 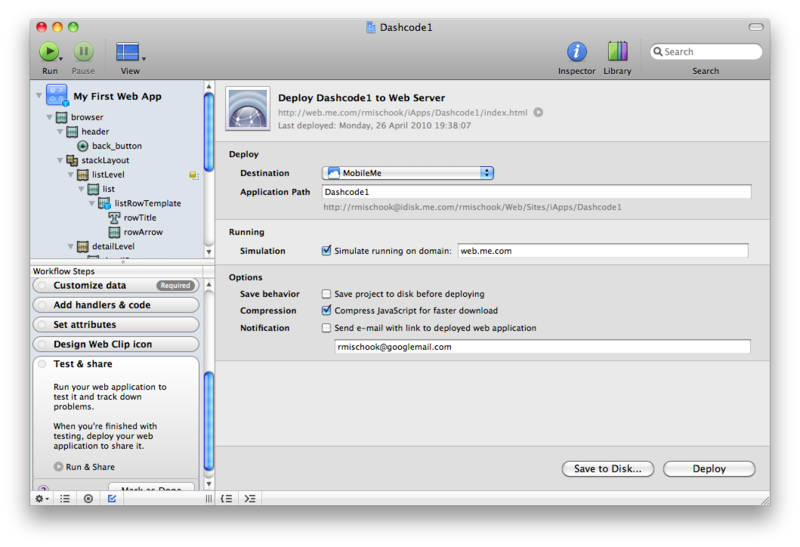 As shown here, Dashcode provides support for developing sites that are suitable for both Mobile Safari and Desktop Safari (the version that runs on Mac and Windows machines). 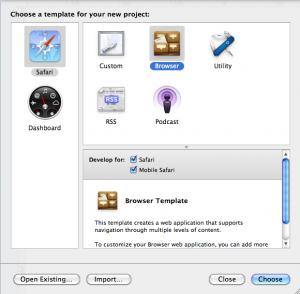 Like Firefox (and unlike current versions of Internet Explorer) Safari supports HTML5. HTML5 promises to unleash a whole new world of cool web applications that contain features currently only achievable using plugins or other proprietary extensions. Another interesting feature of Apple’s development tools, is that they are designed to help you adopt Apple’s development practices. These include concepts you may or may not have been exposed to such as Object Oriented Development and a range of best-of-breed software design patterns like Model-View-Controller, among others. 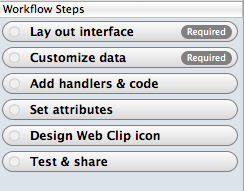 Dashcode is designed to promote good practice in web development, and one of the features is a workflow tool (shown here). If you follow the suggestions the tool provides, you should end up with sites that leverage technologies like AJAX and HTML5 to decouple your screens from your data. This in principle means you should be able to re-use your data URLs to feed other device screens such as a desktop or iPad browser, or a client written using another framework such as Adobe Flex. Note I have said ’in principle’ – I have not actually tried it yet. Once installed, you can launch Dashcode from /Developer/Applications/Dashcode. 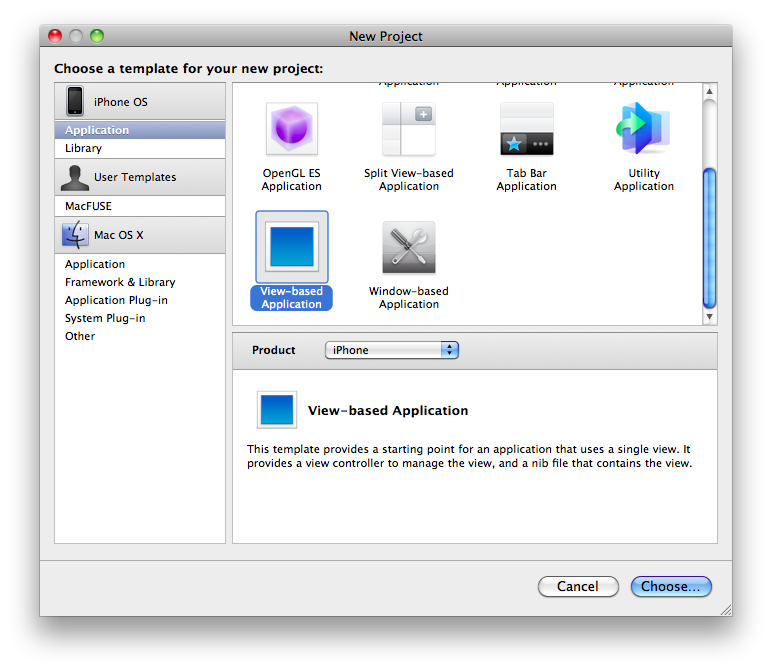 I’ll leave the topic of iPhone web development behind now and turn to application development for iPhone OS. The iPhone, iPod Touch and iPad all run a slimmed-down version of Mac OS X, the same operating system that runs on Apple’s laptop and desktop computers. OS X is essentially a version of Unix which has been significantly enhanced with a range of extras that include the Cocoa libraries; these libraries are what give Mac’s their singular user interface. If your application needs to do any of these things, then it is probably a good candidate for being developed and shipped as an App. Even if your application could be delivered as a web application, there may be good reasons to ‘App-ify’ it; for example Apps can be sold on the App Store (hey money is good). Apple also allows you to sell extra content for your app, so for example a game could allow users to buy extra levels. 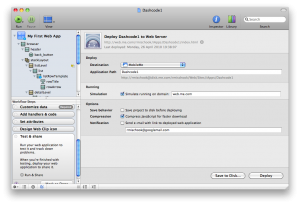 As mentioned earlier, the iPhone SDK contains tools for developing both web and standalone iPhone applications. Having installed the SDK, you can run XCode from /Developer/Applications/XCode to get started. 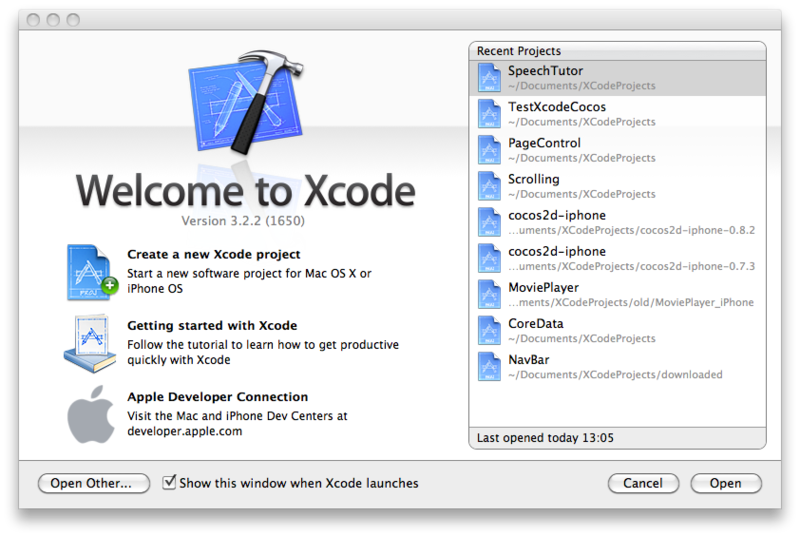 Like Dashcode, XCode provides a series of templates that you can use to get started. 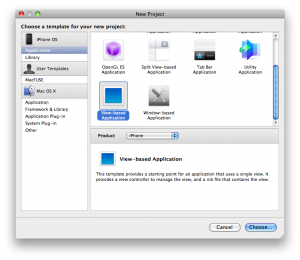 In fact there are open source projects out there that add new templates to XCode. One of the best features of the Apple SDKs is the incredible quality of the documentation, and the way it is integrated into XCode. You can use the document browser directly or link directly to relevant documentation as you are coding. Hopefully the screen shots shown here give you some idea of the richness of the material provided. 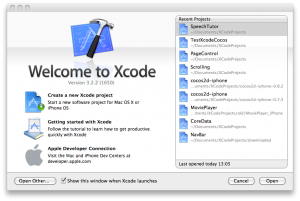 Aside from more formal API documentation, there are lots of zipped XCode projects that you can open up and run to see how they work, while examining and stepping into the code. The Integrated Development Environment (IDE) itself is pretty much what you would expect. It provides syntax highlighting, code completion and on the fly checking among other features. 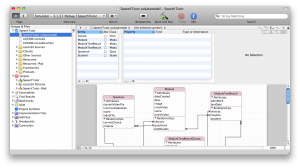 It also includes visual modeling tools like that shown above (which uses Apple’s Core Data API). 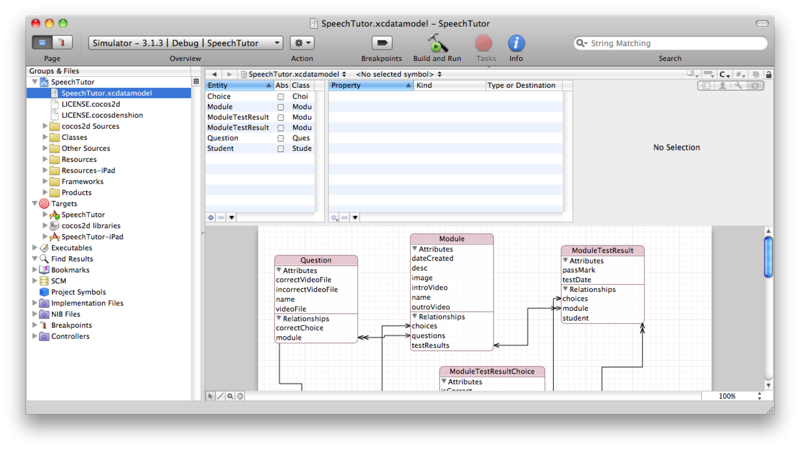 Dynamic Analysis: aside from a good debugger, XCode ships with a suite of tools called Instruments. These are used with the simulator (or your actual iPhone) to monitor your application why it is running. 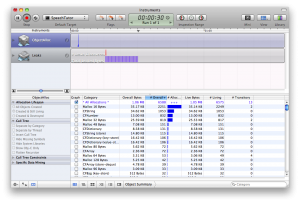 The screenshot below shows the Leaks instrument which – not surprisingly given it’s name – looks for memory leaks. Other instruments include Activity Monitor, Object Allocations and CPU Monitor. Tools like these are vital when developing for a mobile platform where every byte of memory counts. While some might object to having to pay Apple $99 per year, it can be argued that given the benefits listed above, it represents fair value for money. This argument takes on added weight when you consider how difficult it was, prior to the iPhone, to distribute applications on other mobile platforms. Developing for the iPhone can be a lot of fun especially since you have a choice of web verses standalone development models to choose from. 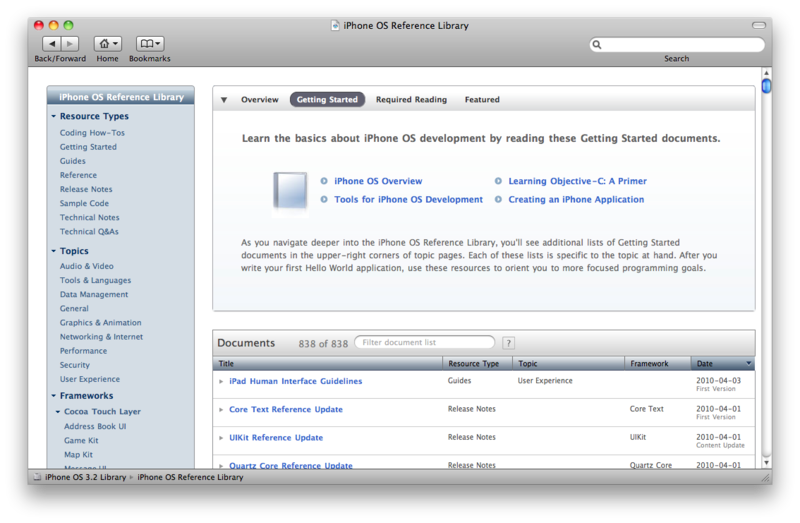 The tools and documentation provided by Apple are very good. In fact they make it relatively easy for someone with no prior experience of mobile development to build a working application quite quickly. The recent introduction and early success of the iPad promises fresh opportunities for developers to be creative and even – with some luck – make some money. And if you manage to tap that iPot of Gold – hey don’t be afraid to share the wealth ;-). This entry was posted on Thursday, May 20th, 2010 at 12:46 pm	and is filed under HTML/XHTML, Programming, Web Design. You can follow any responses to this entry through the RSS 2.0 feed. Both comments and pings are currently closed. I hope you guys, soon made a beginners video tutorials abort IPhone and iPad technology, I will waiting for. As far as the Iphone app development on windows, it can be done. I know of two separate third party frameworks that allow this. Best of all, you dont have to know objective C. The two languages you can choose from are C++ and C# (mono touch). Using Moonlight API you can develop apps that run on the Iphone with silverlight. My favorite part about silverlight is the way the presentation is developed (XAML), very easy language that makes GUI development quite painless. C# is used for the backend which gives silverlight its power. If you have experience with HTML, CSS, and PHP… silverlight will feel rather similar. Althuogh the manner in which XAML and C# talk to each other is different.